We can always count on the nail polish companies to bring out something new and the latest trend is gel effect nail polish. I've had real gel nail polish once before and while I loved the finish, I'm one of those people who like to change their nail polish after 2 or 3 days so it was never going to work out. Also, having gel nails done on a regular basis can really dry out the nails and for me, they just aren't worth the hassle. Now we don't have to worry, we can still have the same effect and almost same lasting power with offerings from Barry M, Nails Inc and Models Own. I've been testing out all the gel effect nail polishes I own and here's what I think of each kind on the market. The range which started it all off was the Barry M Hi Shine Gelly Nail Paints. With the success of the range, they've expanded to around 18 shades so there's a great choice of colour. With the small selection of shades I own, I find the darker shades apply the best, including Blood Orange and Pomegranate. The brush is thin so it's great for applying on smaller nails and the product consistency applies very evenly so it doesn't take a lot of time to paint a nail. The range always lasts really well on my nails and at £3.99 each, you get a lot for what you pay. The texture of the polish once dry is nearly gel nails but perhaps one step down. For the most realistic gel nails, it has to be Nails Inc's Gel Effects. The finish is so spot on with these, you could barely tell they're not real gel nails. The formula applies beautifully on the nails with a very smooth finish and I can easily get over a weeks wear without any sign of chipping. I currently only own the one shade, Bond Street, so I can't comment whether some shades perform better than others but Bond Street is definitely worth picking up! The latest introduction to gel effect nails is the Models Own HyperGels*. They definitely have a lovely glossy finish but in my opinion? Not quite the same gel effect that the Nails Inc offering gives. The shade range features 10 colours, all very wearable, not too obscure shades so it's very easy to pick a colour. Cornflower Gleam applies quite like Essie's Bikini So Teeny, but with a much glossier finish which is great but Red Lustre applied a little too thick for my liking. Compared to Barry M's offering, they apply thicker so you can get away with a single coat where as a few of the lighter Barry M shades require two. Although with the thicker consistency, I find you need to take longer to evenly distribute the polish for a smooth finish. Great range if you want a nail polish with a glossy finish as they're the same price as their regular polishes but for that real gel effect, I'd go with Nails Inc. I hoped that helped narrow down which gel effect polish to pick up on your next shopping trip. 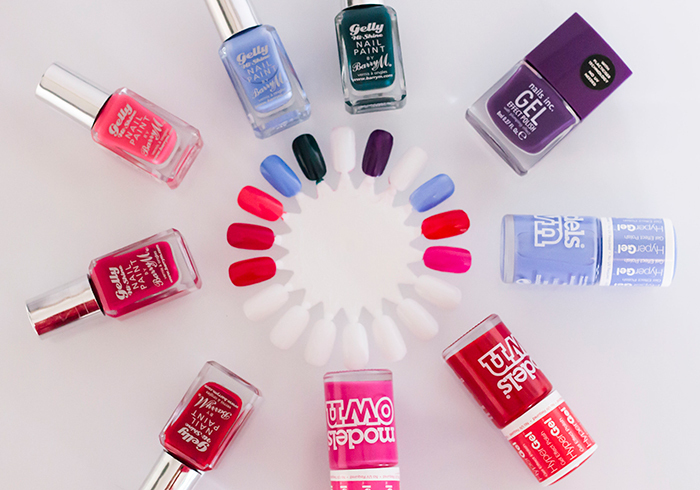 I'd say if you're looking to purchase quite a few shades, definitely give Barry M and Models Own a try but if you're after something extra special, the Nails Inc offering is for you. If you do go for the more affordable options, it's also good to point out that colour wise: Models Own's Cornflower Gleam is a dupe for Barry M's Blueberry and Models Own's Red Lustre is a dupe for Barry M's Blood Orange so if you do pick up some from each brand, you won't need both of those shades! I've never used Nail Polish Canada before but I might have to check it out. Thanks! Thanks Ellis! Theres been so many new Barry M ones since I last picked mine up too, it's tempting to get more but I'm putting myself on a nail polish buying ban! I need to get some more gel polishes. I've got one of the Barry M ones and I think after reading this I need to experiment with a few more brands! :) Gorgeous post!